EDIT: Ok, I know I'm a week late, but I am extremely busy with uni assignments and long-term programming projects at the moment. I do not have the time to constantly check the Vocaloid news websites every day. Hence, I acquired pumpkin_so77's help in keeping the blog up to date with the latest Vocaloid news. That's right! It's back! Remember the Humble Bundle for Android? Now, the Humble Bundle team is bringing you back five incredible games never-before-seen on Android devices! These games of course are cross-platform compatible with Windows, Mac and Linux. 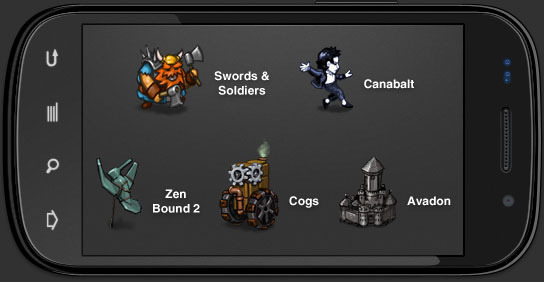 Pay whatever you want to get four amazing games: Zen Bound 2, Avadon: The Black Fortress, Canabalt! and Cogs! Customers who pay more than the average will also receive Swords & Soldiers as a bonus! Each purchase gets you instant access to Windows, Mac, Linux and Android versions of the game, so whatever platform you use, there is a game for you. Most Windows versions can directly be downloaded of Steam by using the provided Steam Keys. Also, you can donate to Child's Play Charity and the Electronic Frontier Foundation. So show your support to these hard working indie developers by purchasing the Humble Bundle. I have done so already and I think it is a great way to show 'thanks' to the developers who put much effort into bringing us fun games to entertain ourselves with. The Humble Bundle #2 offer lasts for 14 days starting now. Head over there to check out the games.